The castle shimmered between the sheer oaks. then reared up high on its way to the heavens. After courteous words with the porter at the gate Sir Gawayn will pass under the portcullis of this castle, ‘shimmering between the sheer oaks’, and then disappear into the maze of a great household. On every side he will find ‘chambers with hearths where charcoal burns’ and courtyards noisy with hurrying chaplains as candles are lit in the galleries. 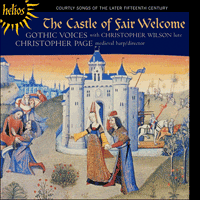 This recording presents some of the music which could be heard in some royal and noble households during the fifteenth century. Most of the composers represented enjoyed the highest patronage available to a fifteenth-century musician. The Englishman Robert Morton, whose rondeau Le souvenir de vous me tue is one of the most beguiling medieval songs, was a chaplain in the employ of Philip the Good and Charles the Bold, Dukes of Burgundy. (Charles was an accomplished composer in his own right, to judge by Ma dame, trop vous mesprenés). Gilles de Binche, called Binchois, was also one of Philip’s chaplains, and the outstanding composer of the period, Guillaume Dufay, may also have had some connection with the Burgundian court; otherwise his patrons included the Malatesta family at Pesaro and later Duke Amadeus VIII of Savoy. Within a castle complex, songs and instrumental pieces like those recorded here were often performed in the grande salle, or Great Hall, especially when the main daily meals of disner and souper were elaborated for festivities at Christmas, Easter and Pentecost. As the Hall filled with ‘such a great wealth of knights and ladies that it was wondrous to behold’ there might be young squires waiting to be dubbed or to be presented with prizes for victory in the lists. These ceremonies were graced by music—and sometimes by polyphonic songs to judge by a revealing passage in the fifteenth-century romance of Cleriadus et Meliadice where we find the hero performing a rondeau in a French salle, ‘the best and finest ever built’, during the celebrations after a tournament. When the company had danced a long while to the minstrels they began to dance to songs. So Cleriadus began to sing what Meliadice had written. A squire from his retinue held the tenor part for him and you may be sure that it was good to hear, for [Cleriadus] sang better than anyone had ever heard before. When he had finished he put a written copy of the song into the hands of Meliadice. De los, de grace et de beaulté. A Great Hall was usually a grandiose building which offered musicians an opportunity to perform en publicque—a conception of musical performance which can be traced as early as the fourteenth century in France. A large, open space with a wooden roof and tiled floor, it was usually embellished with hangings or tapestries; yet a substantial amount of wall-space might remain uncovered and even when the Hall was full of courtiers it probably provided singers with a spacious and resonant acoustic. The same may be said for instrumentalists, especially players of the lute and harp, often combined in the fifteenth century. To judge by contemporary pictures these instruments were sometimes used in the Hall with the musicians standing at floor-level or raised up aloft in a small gallery. It was in the chamber that songs like those recorded here took their rightful place in chivalric culture. During the course of an evening in the chamber an escuier might hear songs by Morton or Dufay one moment and passages from romances or ancient histories of Tristan or Julius Caesar the next. Then the conversation might turn to a nice point of tournament protocol. Like blazons painted on a herald’s roll, these things passed before the escuier as he sat in the chamber and each one was enveloped in the same aura of excellence. In these noble and royal milieux the tone and technique of anything written in French, whether for entertainment or for edification, was much the same, and it did not matter if the work in hand were a romance of King Arthur, a treatise on tourneying, or a love-song in rondeau form. All had the ceremonial quality of an official proclamation, the formality of a diplomatic letter and the hyperbole of a scrupulous speech by an ambassador newly arrived at court. The formal and grandiloquent tone of these poems, together with the degree of craftsmanship which the author had brought to his chosen poetic form, usually mattered more than what the words of the poem actually said. Indeed most of the poems recorded here have no more ‘meaning’ to them than the leafy sprays and branches painted in the margins of fifteenth-century manuscripts. Like those gilded flourishes, an amorous rondeau fills a space in a gracious and conventional way. Now and then, however, we encounter a poem whose ambitions go much further: Christine de Pisan’s lament for the death of her husband—Dueil angoisseux—is one of the most moving of all medieval poems. In musical terms the most striking difference between these later fifteenth-century songs and those by composers active in the early 1400s lies in the harmony. Most medieval polyphonic songs consist of a top part (the cantus) supported by an indispensable lower part (the tenor) and one or two optional parts (the contratenors). During the period 1350–1450 the contratenor usually lay in the same range as the tenor, but the half-century from 1450 to 1500 saw the contratenor sink in pitch until it became a contratenor bassus, lying substantially below the tenor. (In the opening passage of Morton’s Que pourroit plus, for example, six adjacent movements of the tenor and contratenor produce parallel tenths—quite impossible in terms of fourteenth-century styles.) The contratenor bassus may also be heard in Morton’s other songs recorded here, in Vincenet’s La pena sin ser sabida and in Regis’s Puisque ma damme/Je m’en voy. The contratenor bassus had much to offer: it permitted wider chordal spacings than had previously been possible and thus placed new sound-colours at the disposal of musicians. In fourteenth-century music a major or minor triad will usually be in close distribution; wider spacings arise only as occasional and transitory effects. But it is fundamental to the technique of a composer like Robert Morton that triads are often widened to a tenth superimposed upon a fifth (d–a–f´) or, in a way that combines wide spacing with narrow, to a twelfth over a third (d–f–a´), this last being one of the most delicate and characteristic colours of later fifteenth-century song. courteously kneeling on the cold ground to greet him. where a great fire is fiercely aflame on the Hearth. Let us follow Sir Gawayn. Le château scintillait entre les chênes éclatants. Puis s’élevait haut jusques aux cieux. Après avoir adressé quelques mots courtois au portier, Sir Gawayn passera sous la herse de ce château, scintillant «entre les chênes éclatants», puis disparaîtra dans le dédale d’une vaste demeure. De tous côtés, il découvrira «des chambres avec des âtres où brûle du charbon de bois» et des cours bruissantes de chapelains empressés, à l’heure où l’on allume des bougies dans les galeries. Cet enregistrement propose un peu de la musique que l’on pouvait entendre au XVe siècle, dans les maisons nobles et royales. La plupart des compositeurs représentés ici jouissaient du mécénat alors le plus élevé pour un musicien. L’Anglais Robert Morton—dont le rondeau Le souvenir de vous me tue est l’une des plus séduisantes chansons médiévales—fut ainsi chapelain de Philippe le Bon et de Charles le Téméraire, ducs de Bourgogne (lequel Charles était lui-même un compositeur accompli, à en juger par Ma dame, trop vous mesprenés). Gilles de Binche, dit Binchois, fut également l’un des chapelains de Philippe; quant au compositeur phare de l’époque, Guillaume Dufay, il se peut qu’il ait été lié à la cour bourguignonne, lui qui compta parmi ses protecteurs les Malatesta de Pesaro et, plus tard, le duc Amédée VIII de Savoie. Parmi tous les bâtiments du château, c’était souvent la grande salle qui accueillait les chansons et les pièces instrumentales enregistrées ici, surtout quand les principaux repas quotidiens (disner et souper) étaient élaborés pour les festivités de Noël, de Pâques et de Pentecôte. Tandis que la salle s’emplissait d’une «si grande presse de chevaliers et de dames que c’était merveille à voir», de jeunes écuyers attendaient parfois d’être adoubés ou récompensés pour avoir remporté des joutes. Ces cérémonies étaient agrémentées de musique—et, quelquefois, de chansons polyphoniques, à en croire un passage révélateur de Cleriadus et Meliadice (roman du XVe siècle), où le héros interprète un rondeau dans une salle, «la meilleure et la plus belle jamais construite», pendant des célébrations, après un tournoi. Quand les invités eurent dansé un long moment au son des ménestrels, ils commencèrent de danser sur des chansons. Aussi Cleriadus se mit-il à chanter ce que Meliadice avait écrit. Un écuyer de sa suite tenait la partie de tenor pour lui et vous pouvez être sûr que c’était joli à entendre car [Cleriadus] chantait mieux que tous ceux entendus auparavant. Lorsqu’il eut fini, il plaça une copie de la chanson entre les mains de Meliadice. La grande salle était généralement un bâtiment grandiose qui permettait aux musiciens de jouer en publicque—une conception de l’exécution musicale que l’on peut faire remonter au XIVe siècle, en France. Vaste espace dégagé doté d’un toit en bois et d’un sol carrelé, elle était ordinairement décorée de tentures ou de tapisseries; pourtant, de grands pans de murs pouvaient demeurer nus et, même remplie de courtisans, elle offrait probablement aux chanteurs une acoustique spacieuse et résonante. Aux chanteurs, mais aussi aux instrumentistes, surtout des luthistes et des harpistes, souvent associés au XVe siècle. Si l’on en croit les tableaux de l’époque, le luth et la harpe étaient parfois utilisés dans la salle, les musiciens se tenant au niveau du sol ou en contrehaut, dans une petite galerie. C’était dans cette chambre que des chansons comme celles enregistrées ici trouvaient leur juste place dans la culture chevaleresque. Au cours d’une soirée, un escuier pouvait entendre des chansons de Morton ou de Dufay et, juste après, des passages tirés de romans ou d’histoires anciennes, de Tristan ou de Jules César. Puis la conversation pouvait glisser vers une subtilité du protocole des tournois. Pareilles aux blasons peints sur un registre de héraut, toutes ces choses défilaient devant l’escuier assis dans la chambre, toutes nimbées de la même aura d’excellence. Dans ces milieux nobles et royaux, tout ce qui était écrit en français, pour divertir comme pour édifier, avait grosso modo le même ton, la même technique, et peu importait qu’il s’agît d’un roman du roi Arthur, d’un traité de tournoi ou d’une chanson d’amour en forme de rondeau. Tous affichaient le cérémonial d’une proclamation officielle, la formalité d’une missive diplomatique et l’hyperbole d’un discours soigné d’ambassadeur frais arrivé à la cour. Le ton officiel et grandiloquent de ces poèmes, allié à la maîtrise apportée par l’auteur à la forme poétique de son choix, primait en général sur le sens des mots. De fait, la plupart des poèmes enregistrés ici n’ont pas plus de «signification» que les branches et les ramures feuillues peintes dans le marges des manuscrits du XVe siècle. Pareil à ces fioritures dorées, un rondeau amoureux comble un vide de manière gracieuse et conventionnelle. Mais, de temps à autre, un poème surgit, dont les ambitions vont bien outre: la lamentation écrite par Christine de Pisan pour la mort de son mari—Dueil angoisseux—est l’un des plus émouvants poèmes du Moyen Âge. Sur le plan musical, c’est surtout au niveau de l’harmonie que ces chansons de la fin du XVe siècle se distinguent de celles écrites au début des années 1400. La plupart des chansons polyphoniques médiévales présentent une partie supérieure (cantus), soutenue par une indispensable partie inférieure (tenor), plus une ou deux parties optionnelles (contratenor). Dans la période 1350–1450, le contratenor était généralement dans le même registre que le tenor; puis les années 1450– 1500 le virent s’abaisser jusqu’à devenir un contratenor bassus, situé bien en dessous du tenor. (Ainsi, dans le passage d’ouverture de Que pourroit plus de Morton, six mouvements adjacents du tenor et du contratenor produisent des dixièmes parallèles tout à fait impossibles dans les styles du XIVe siècle.) Le contratenor bassus se retrouve dans les autres chansons de Morton enregistrées ici, dans La pena sin ser sabida de Vincenet et dans Puisque ma damme/Je m’en voy de Regis. Le contratenor bassus avait beaucoup à offrir: il permettait de plus larges positions et, partant, proposait aux musiciens de nouvelles couleurs sonores. Dans la musique du XVe siècle, un accord parfait majeur ou mineur apparaît généralement dans une disposition serrée, des espacements plus larges ne survenant que sous forme d’effets occasionnels et transitoires. Mais il est un fait essentiel à la technique d’un compositeur comme Robert Morton: les accords parfaits sont souvent élargis jusqu’à atteindre soit une dixième surimposée à une quinte (ré3–la3–fa4), soit, d’une manière qui combine un espace large avec un espace étroit, une douzième surimposée à une tierce (ré3–fa3–la4)—cette dernière étant l’une des couleurs les plus délicates et les plus caractéristiques de la chanson de la fin du XVe siècle. courtoisement agenouillés sur le sol froid pour l’accueillir. Où un grand feu flamboie furieusement dans l’âtre.